When the Vegas Golden Knights select one player from each of the other 30 NHL teams in the expansion draft on June 21, it’s important for general manager George McPhee to hit home runs with some of their selections if they hope to be a contender for a Western Conference playoff spot in 2017-18. This year marks the seventh expansion draft since 1991, with San Jose, Ottawa, Tampa Bay, Nashville, Atlanta, Columbus and Minnesota each participating in a draft during that time. A total of 214 players were selected during those seven drafts, with some fading away to obscurity while others became cult players for their respective franchises. Which players will become synonymous with the Vegas Golden Knights in the future? Only time will tell, but for now, here are the top 10 players chosen in the expansion draft since 1991 who had an indelible impact on the teams that selected them. San Jose, Ottawa and Atlanta have no players on this list, while Nashville and Florida are tied for the most with three. Minnesota has two players included, while Columbus and Tampa Bay each have one. Dowd bounced between the minors and the NHL with five different organizations for the better part of nine seasons before being selected 41st overall in the 2000 Expansion Draft by Minnesota. He was a tireless worker for the Wild for almost four seasons from 2000 to 2004, hitting a career high in goals (13) and points (43) in 2001-02. Dowd was a solid skater and grew into a leadership role for the Wild with his steady two-way game. After 283 games in Minnesota, the Brick, New Jersey product was traded to Montreal for a fourth round pick in the 2004 NHL Entry Draft. Dowd also played for the Canadiens, Chicago, Colorado, New Jersey and Philadelphia before retiring in 2008. Johnson was a veteran of six NHL seasons when the Predators selected him with the 17th pick in the 1998 Expansion Draft. The Thunder Bay, Ontario native was coming off the second best season of his career to that point, posting 12 goals and 22 assists in 74 games for the Pittsburgh Penguins and Chicago Blackhawks. He thrived in a bigger role in Nashville, setting a career high of 16 goals and 34 assists during the Preds inaugural season. Johnson served as the second captain in Nashville history, wearing the ‘C’ from 2002 to 2006. He left the Predators to sign with Detroit as a free agent in August 2006, but was forced to retire due to a hereditary heart abnormality. Overall, Johnson played seven seasons in Music City. Sanderson was a nine-year veteran when the Buffalo Sabres left him exposed in the 2000 Expansion Draft. He was snapped up by Columbus with the 12th pick and proved to be a shrewd selection by Blue Jackets GM Doug MacLean. Sanderson wore an ‘A’ for Columbus for four seasons between 2000 and 2004, twice scoring 30-plus goals and becoming the first Blue Jackets player to notch a hat trick. The Hay River, Northwest Territories product is sixth all-time in goal scoring with Columbus and his 34 markers in 2003-04 is the fifth highest single season total in Blue Jackets’ history. Sanderson was traded by Columbus to Vancouver at the 2004 NHL trade deadline, with a condition of the deal that he return to Ohio following the season. He only played two games with the Jackets in 2005-06 before being shipped to Phoenix. Sanderson also played in Philadelphia and Edmonton before hanging up the skates for good in 2008. Thought to be strictly a defensive forward before joining the Panthers, Fitzgerald posted career highs in goals and points during a five year career in Florida. He was chosen 24th overall in the 1993 Expansion Draft. In the Panthers’ inaugural season, Fitzgerald set a career high in goals with 18. He also set a career high in points with 34 during 1995-96. The right winger from Billerica, Massachusetts, played a key role in the Panthers reaching the Stanley Cup Final that year as he potted the winner in game seven of the Eastern Conference final against Pittsburgh. He finished the playoffs with eight points in 22 games. Fitzgerald was traded to Colorado in March 1998, but only played 11 games with the Avalanche before becoming a free agent that summer. He signed with Nashville and became a leader on a young Predators team experiencing its own expansion growing pains. Kuba was unproven as an NHL player when the Wild chose him with the 34th pick in the 2000 Expansion Draft. He had only played 18 games in Florida over two seasons to that point. Kuba made an immediate impact on Minnesota’s roster in 2000-01 and was second among Wild defensemen in scoring with nine goals and 21 assists in 75 games. The Czech blueliner compiled 33 goals and 99 assists over five seasons in Minnesota and he still sits as the franchise’s all-time leading scorer among defensemen. Kuba was named team captain of the Wild on two occasions during his time with the team, as part of its monthly rotating captaincy. He also represented Minnesota in the 2004 All-Star Game. The Wild let Kuba go as a free agent in July 2006 and he signed with Tampa Bay. 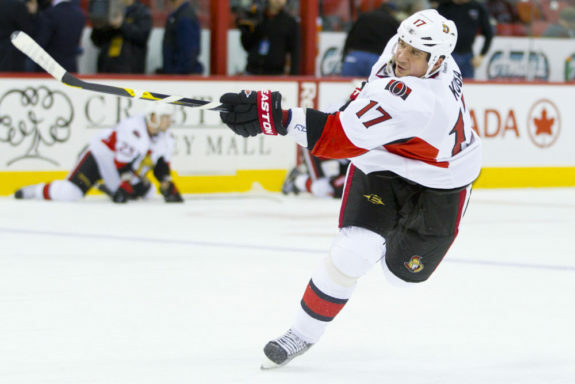 He would skate seven more seasons in the NHL with the Lightning, Ottawa and Florida before being bought out by the Panthers in 2013. Nicknamed ‘Wild Thing’ while a member of the Vancouver Canucks, Walker was the final selection of Nashville in the 1998 Expansion Draft. He flourished in an expanded role with the Predators and was fifth in team scoring with 15 goals and 25 assists during their inaugural season. The gritty forward from Cambridge, Ontario finished with 96 goals and 151 assists in 410 games played over seven seasons in Music City. Walker posted three seasons of 40 points or more in Nashville, including 25 goals and 42 assists for 67 points in 2003-04, which led the Preds in scoring. He also served as interim captain when Greg Johnson was sidelined with an injury in 2002-03. Walker was traded to Carolina in July 2006 and played five seasons with the Hurricanes and Washington. He officially announced his retirement in December 2010. Before Pekka Rinne rewrote the Predators goaltending record book, it was owned by Vokoun. When Nashville took him with the 34th pick in the 1998 Expansion Draft, Vokoun hadn’t yet established himself as an NHL goaltender, only getting into one game with Montreal. With the Preds, he played 37 games in their first season and finished 13th in voting for the Calder trophy. The Czech netminder spent nine seasons in Nashville and set franchise records in games played (383), wins (161), shutouts (21) and goals-against-average (2.54). Each of those records have since been surpassed by Rinne. Vokoun’s play during the Predators’ first few seasons went a long way toward establishing the team’s credibility and included a playoff appearance in their sixth season. Vokoun finished among the top-10 in Vezina trophy voting four times and top-10 in All-Star voting three times while with the Predators. The overall development of Rinne spelled the end of Vokoun’s time in Nashville and the Preds traded him to Florida in June 2007 for a 2008 first-round draft pick, a 2007 second-round pick and a conditional second-round selection. 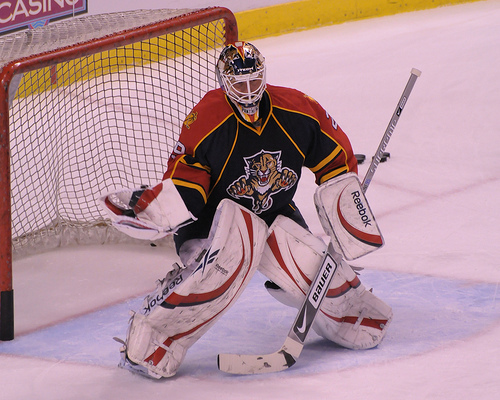 He spent six more seasons in the NHL with the Panthers, Washington and Pittsburgh before retiring in December 2014. Mellanby scored the first goal in Panthers’ history, but his standing on this list is based on the power forward playing a huge role in leading Florida to respectability as an expansion franchise, which included a Stanley Cup Final in 1996. Mellanby was a seven year NHL veteran when Edmonton left him unprotected in the 1993 Expansion Draft and the Panthers chose him with the 30th pick. His robust style of play and scoring acumen endeared him to the Panthers faithful, but Mellanby gained a cult following when he famously used his stick to kill a rat in the team’s dressing room. He killed the rat prior to their 1995 home opener against Calgary and scored two goals using the same stick that night. Fans in Florida responded by throwing thousands of plastic rats on the ice when the Panthers scored — a trend that reached a fever pitch in the 1996 playoff run. The right winger from Montreal played eight seasons in Miami and served as captain from 1997 to 2001. Mellanby is featured in the top five of a number of Panthers’ all time records including games played (5th), goals (2nd), assists (4th), points (3rd) and power play goals (1st). He was traded to St. Louis in 2001 and played six more NHL seasons with the Blues and Atlanta. Mellanby hung up his skates for good in April 2007. Every expansion team has its first bonafide star, but it’s not often that star is found in the expansion draft itself. For the Tampa Bay Lightning, that’s exactly what happened when it selected Bradley from Toronto with the 36th pick in the 1992 Expansion Draft. The Kitchener, Ontario center had a solid NHL career before joining the Lightning, but it’s unlikely anyone predicted his break out in 1992-93. 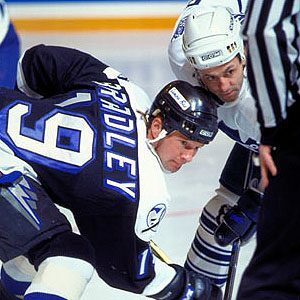 During Tampa Bay’s first season, Bradley posted 86 points in 80 games. His 42 goals represented more than his previous four seasons with the Maple Leafs and Vancouver combined. In addition, his play propelled the Lightning to a respectable 23-54-7 record for 53 points that season. As a comparison, Tampa Bay’s expansion cousins in Ottawa had a 10-70-4 record that same season while the sophomore San Jose Sharks were 11-71-2. In six seasons in Tampa, Bradley averaged just under a point-per-game, including a personal best of 56 assists in 1995-96. He is currently seventh in franchise history in goals, assists and points and was also selected to the All-Star Game in 1993 and 1994. Injuries limited Bradley’s play in his final two NHL seasons and he retired after the 1997-98 season. His impact in Tampa Bay was recognized earlier this year when he was inducted into the Sports Club of Tampa Bay Hall of Fame. With a roster made up of other team’s castoffs, expansion teams often struggle mightily during their inaugural season. Expansion rules for the 1993 draft dictated that teams could only protect one goaltender. That left the New York Rangers with a dilemma, since they had arguably the best duo in the NHL at the time in Mike Richter and Vanbiesbrouck. 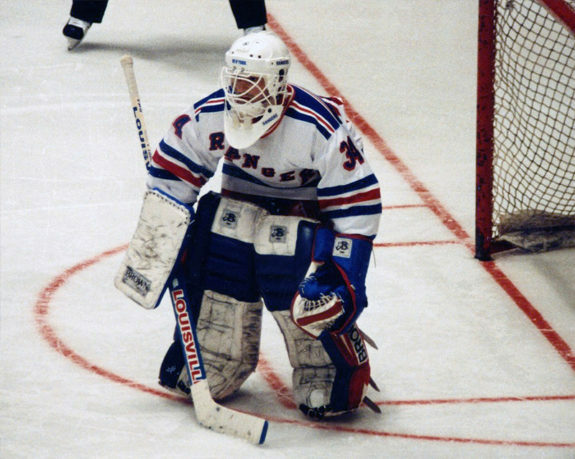 Rather than lose Vanbiesbrouck for nothing, the Rangers traded him to Vancouver for future considerations. Florida nabbed the 1986 Vezina trophy winner with the first overall pick in the expansion draft and he became the immediate face of the franchise. The Detroit product was tasked with growing the game in Miami and spent the months leading up to the 1993-94 season representing the Panthers at various community events and businesses, educating fans about hockey. On the ice, he was named as Florida’s representative for the 1994 NHL All-Star Game, finished fourth in goals-against-average (2.53), and had one of the coolest goalie mask designs of all time. The Panthers finished the season with 83 points, one point back of the final playoff spot in the Eastern Conference. Vanbiesbrouck was instrumental in Florida making it to the 1996 Stanley Cup Final, leading the league in saves (685) during the post-season and finishing second in save percentage (.932). He made 55 saves in Game Four as the Panthers lost 1-0 to Colorado in triple overtime, but finished third overall in voting for the Conn Smythe trophy as playoff MVP. Vanbiesbrouck played five seasons with the Panthers and is second all-time in games played (268) and wins (106). He is third all-time in shutouts with 13 and represented Florida three times at the All-Star Game. ‘Beezer’ signed with Philadelphia as a free agent in the summer of 1998 and played four more seasons with the Flyers, Islanders and New Jersey before retiring. His impact in Florida was immortalized when he was inducted into the Florida Sports Hall of Fame in 2015.